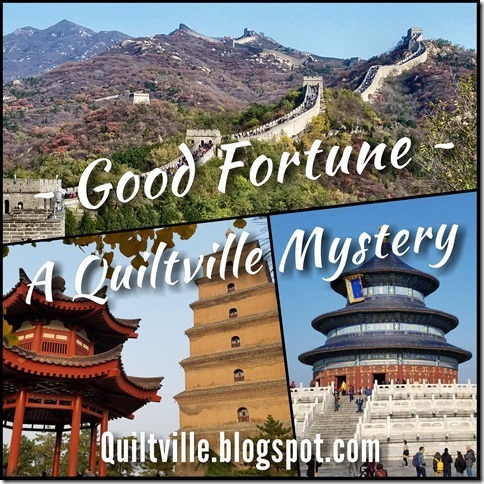 So, I mentioned a couple of weeks ago that I planned to start a second, new (for me), Bonnie Hunter design, in addition to the others that are already on the go. This is it! North Americans will know the pun, which I just could not resist. Every New Year's Day our family used to watch the Rose Bowl parade from Pasadena, California. My grandfather was a wholesale flower supplier, so flowers are in our blood. 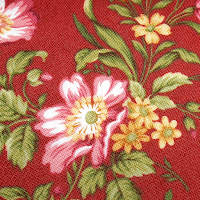 This fabric is from the Savannah Garden collection by Henry Glass. 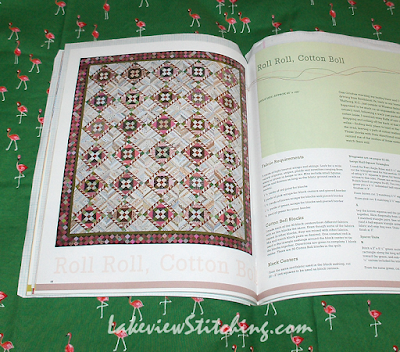 The pattern is now in Bonnie's book, String Fling (2012). The main colours in Bonnie's quilt are red, pink and green. I tried many variations over the past year, and finally settled on just a two-colour scheme, red and white. When I realized that I could use all my rose-themed florals, and call it "Rose Boll," the decision was made! Of course, now I've also started two more red and white quilts, 150 Canadian Women and Wild & Goosey, so I'm going to be up to my neck in red and white this year. I miscalculated and cut everything about a 1/2" scant! But, it's ok. I can still use it, but now the whole thing will need an extra bit of care when I make the final cuts. 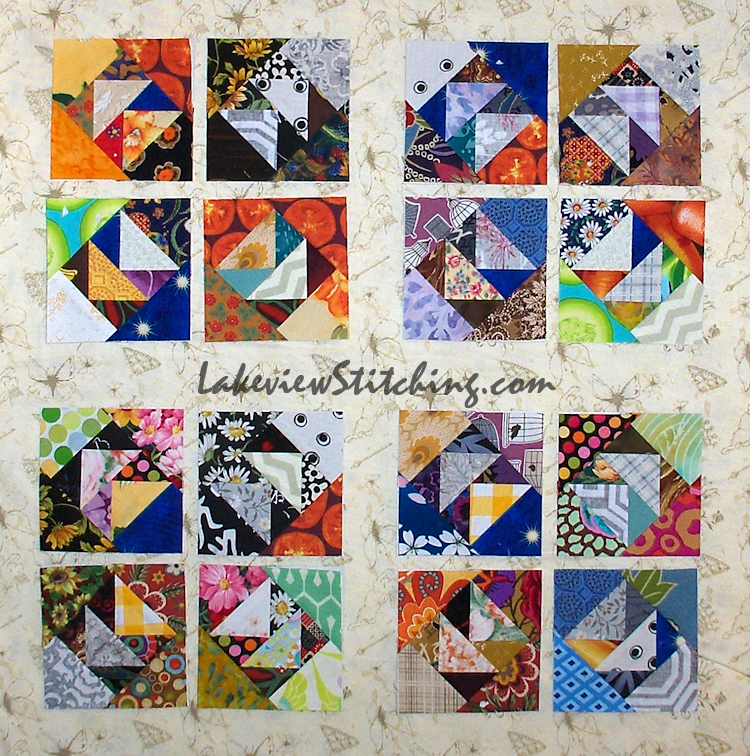 There are some scant seams in the first block to make up for my cutting error. But, I think it worked! 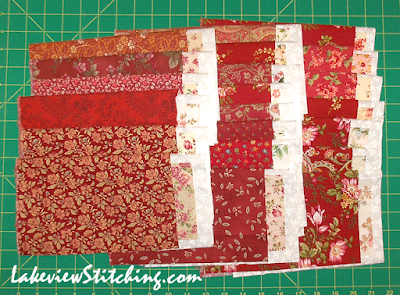 Actually, with these two blocks you can see the range between the fairly solid red and the boldest floral in the mix. Although I have lighter reds in my stash, these dark reds seemed very determined to be in the quilt. Despite all the florals, I think it's going to be very graphic. 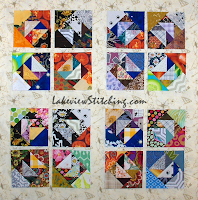 What a fun year is ahead of you creating some of Bonnie Hunter's quilts. She would be so tickled that you are on a roll! What stories you must have of the parade and of where your grandfather's flowers went! Well, everything stayed local back then. But, it's certainly been an influence! Oh, that's going to be gorgeous! I made a RRCB back when it was a mystery and it was one of my fav BH mystery quilts. Cotton Boll is one of my favorites. Yours will be stunning! Yesterday I finishe mystery clue #6. Good thing, too, because Bonnie posted the big reveal this morning. I love the red and white, and have dreamed of making a red and white quilt for many years. It's going to be lovely. 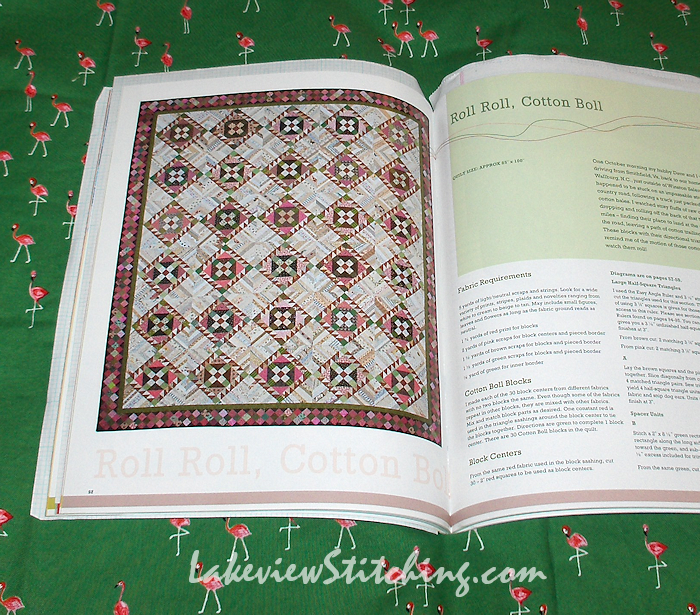 Rose Boll is going to be a fun (and pretty) quilt! I've been wanting to make Orca Bay ever since I realized I had missed out on the mystery sew along--looking forward to seeing what you do with that one! 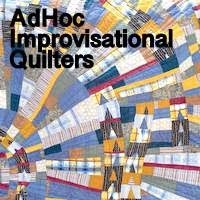 I like the Cotton Boll quilt a lot and your plans sound very promising. It looks like you have a kind of a theme going for 2017! Great idea, great range of fabric and great name. I'm interested in the way you get a flow from the centre outwards in both the blocks so far at the same time maintaining contrast. Bit of cleverness there. Shaping up to be a creative year! Yes, plenty of fun lined up this year! Red and white seems to be your theme this year, but each one will be so different. The Rose Boll is a clever interpretation. 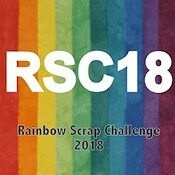 It's going to be fun! Wow! 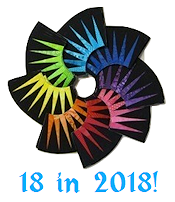 Your dance card is already seriously full with all of your new quilts and you're still planning on more (Orca Bay, Prairie Star). Your energy and enthusiasm are enviable. I was tempted to participate in the "150 Canadian Women" quilt until I came down with a respiratory virus that has had me out of commission since early December. I'll have to be content by following your progress on it. 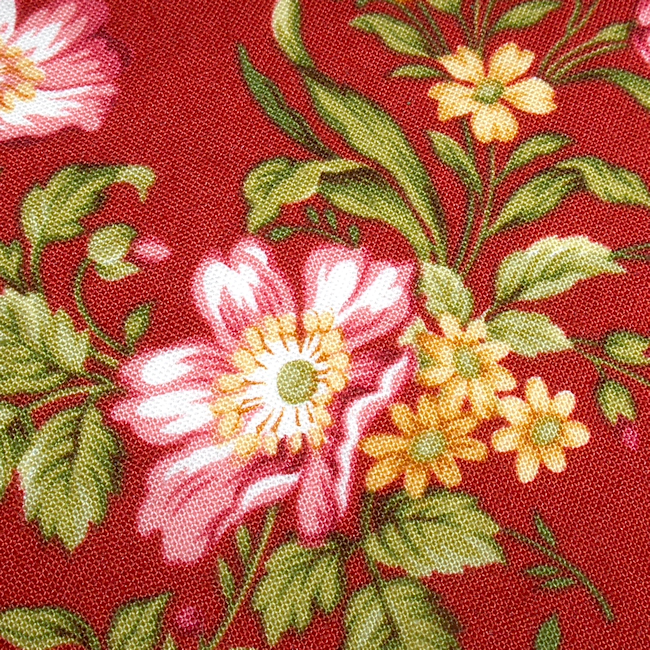 I love the red rose fabrics for "Cotton Boll". (I recognize many from my own stash). It will be a beautiful quilt. Well, for 150 Canadian Women you can start any time, and then get the CD at the end for the blocks you missed. It is available for pre-order now. But that is hard to be sick over the holidays. I hope you will soon be busy again. For me, finally starting all these projects that have been planned for a long time has been very refreshing and a big relief. 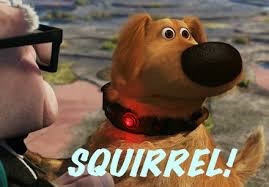 Now I can stop thinking about them and focus on my current project! 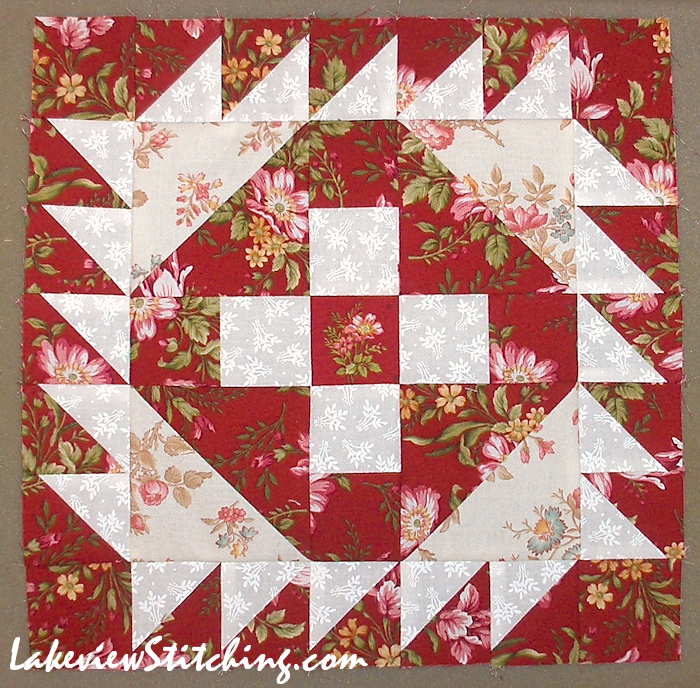 You have chosen some beautiful reds for this quilt! Il est plus que temps pour moi de venir vous rendre visite, après nos agréables bavardages chez moi. Quel plaisir de voir vos ouvrages! Si j'ai un peu délaissé les techniques de piécé et appliqué je n'en reste pas moins une sincère admiratrice.